On the morning of May 11th, 2012, the official Facebook fan page of JYJ published the behind the scene stills of Kim Jaejoong at the filming set of new drama “Time Slip Dr. Jin”. On the Facebook, “Actor Kim Jaejoong is filming ‘Time Slip Dr. Jin’,” was also written. 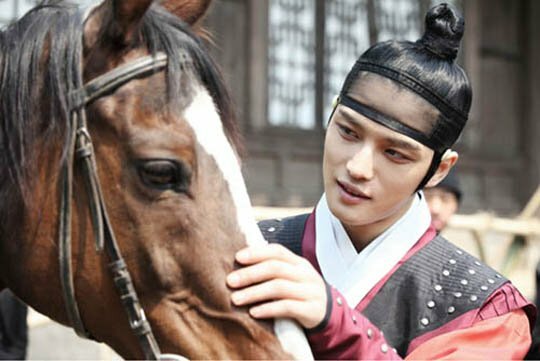 In the photo, Kim Jaejoong’s hair was worn in a bun, while he was wearing the officer’s robe of Joseon Dynasty, and used his hand to gently touch the head of the horse. In another photo, Kim Jaejoong was seriously reading the script, the fair skin and superior appearance are very photogenic. Kim Jaejoong is starring in new MBC weekend drama “Time Slip Dr. Jin” which debuts on May 26th, 2012. The drama is adapted from Japanese comic “Jin” by Motoka Murakami which ran for 10 years. It tells the story hard work and plain living by top surgeon of South Korea after he travels through time to go from 2012 to 1860’s Joseon Dynasty. Hero Jaejoong who challenges the historical drama for the first time is playing the role of palace guard Kim Kyung Tak who is excellent in martial arts, has desire to prevail over others, and has sadness hidden deep inside his heart, and has been receiving infinite expectation of the fans. In addition, “Dr. Jin” succeed “Feast of the Gods” to premiere on May 26th, 2012 at 9:50pm.